With the continued introduction of new potato cultivars, accurate identification is becoming difficult but is essential for maintaining cultivar integrity and Plant Breeders’ Rights. Hypervariable DNA sequences, referred to as simple sequence repeats (SSRs) or microsatellites, have been reported to be an excellent source of genetic markers. To determine the abundance, distribution, and composition of SSRs withinSolanium tuberosum, 252 sequences were searched for tetranucleotide and smaller SSRs with a minimum length of 20 nucleotides and a maximum discrepancy of two nucleotides. In total, 40 unique SSRs were observed in the 252S. tuberosum sequences examined and occurred at a frequency of one SSR every 8.1 kb. 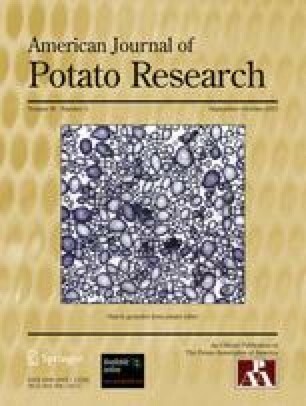 To assess the ability of site-specific amplified SSRs to identify potato cultivars, a simple (TCAC)m and compound (TCAC)m • (CTT)n SSR 5’ to the starch synthase gene and a compound (C)p • (CT)q • (AT)r • (G)s SSR 5’ to the sequence encoding mature proteinase inhibitor I, were examined and shown to produce unique DNA profiles for 73 of 95 tetraploid cultivars. In total, 24 alleles were observed at these loci and the accurately sized amplified DNA products can be used to establish a database for cultivar identification. Site-specific amplified alleles were somatically stable and have been conserved in clonal variants of Russet Burbank independently maintained for almost seven decades, a characteristic essential for cultivar identification. As genetic markers, the abundant, informative, and easily examined site-specific amplified alleles of SSRs are ideal for quickly and accurately determining cultivar identity of S.tuberosum ssp.tuberosum.